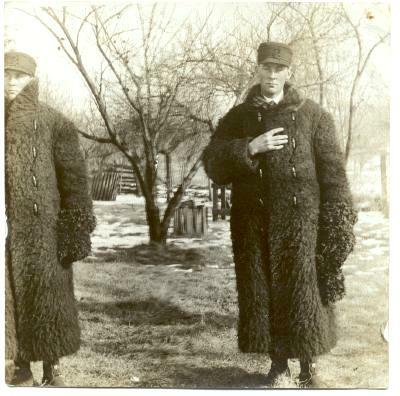 PHOTO - Men Wearing Heavy Fur Coats - Soldiers ??? Home > Photos > PHOTO - Men Wearing Heavy Fur Coats - Soldiers ??? Two men wearing long, heavy fur coats and wool caps. People and location unknown, but the photo was found with WWI-era items. Photograph measures approx 3-1/2 x 3-1/2 inches. Slight corner tip wear. Very shallow pressure creasing at corners.